"Together as the Dubliners, they are enough to warm the heart of any Irishman and to frighten the British immigration authorities. They are Dublin's darlings; impossible for an audience to resist and impossible to record. We recorded them." Formed in 1962 in O'Donoghue's Pub, Dublin, The Dubliners were arguably the most popular Irish Folk Band in the world. 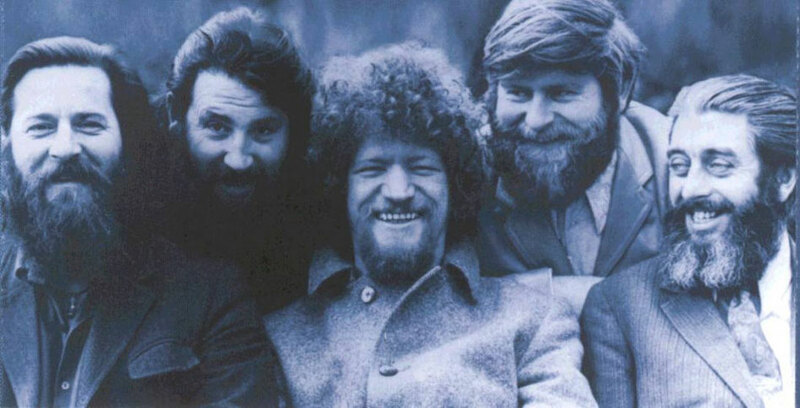 The founding members were Ronnie Drew, Barney McKenna, Luke Kelly and Ciarán Bourke, with John Sheahan joining the group in 1964. In 2012, while celebrating the band's 50th anniversary, Barney McKenna, the last surviving founding member, passed away on April 5th, at the age of 72. Towards the end of that year John Sheahan announced his retirement — officially ending the era of The Dubliners. This site is dedicated to Ronnie Drew.